I got waylaid putting together a very detailed post about how the newly-widened Panama Canal is disrupting the internal US transportation network. When it goes up at Seeking Alpha, I’ll link to it. 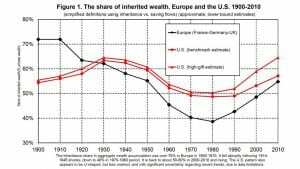 It’s likely that about 25% of all wealth in the US is inherited of the top 1%. I strongly suspect the relationship is even more egregious at the level of the top 0.1% and top 0.01%. It’s hard to argue that the US is at all a meritocracy when the starting points are so distorted. FDR called it economic royalty. Time to return to that phrase. Well today it is political royalty as well. They completely own one of the major political parties, have a lien on the second, and control the boards of the primary media corporations. And we wonder why things are so screwed up? Because by and large they are idiots. Its a stagnant gene pool. What caused the drop in Europe? 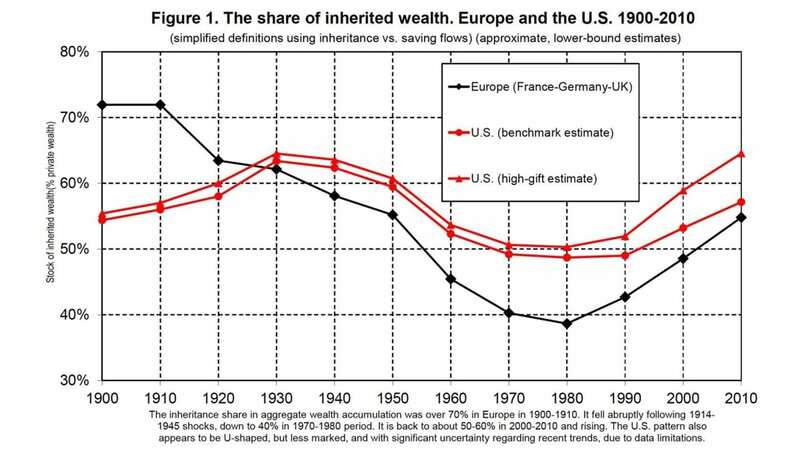 Wealth/inheritance taxes or devastation from 2 wars?